Unique and customizable themes, listed below, for matching suite of wedding invitations, enclosure cards and all day-of papers. Selected by Paper and Frill, these sets include items such as RSVP reply cards, Map and Directions cards, Wedding Information and Program cards, Save the Date cards, Belly bands, Menu cards, Table cards, Stickers, Address labels, Ribbon, Gift wrap, Ribbon and Gift and Favor boxes and Gift bags, all in on-trend colors for personalized wedding papers. This beautiful and elegant design, called Rustic Fall Leaves Wedding, has a beautiful cream background with a collage of autumn colored leaves in yellow, orange, gold, and burgundy. There is a pretty delicate border to set your text off. Elegant and fit for a royal. Perfect for your fall, autumn or outdoor wedding or event. Rustic wreath wedding invitation suite featuring a beautiful and whimsical frame of watercolor leaves, plants and greenery. This green leaf wedding collection includes all of the essentials, and more! Invitations, envelopes, stamps, labels, belly bands, five RSVP options, enclosure cards, save the date, thank you cards, and all of the paper for your ceremony and reception. Rustic harvest stationery suite featuring a country chic wooden background, black chalkboard centrepiece, rope, halloween pumpkins, fall foliage, acorns, a scattering of autumn leaves, string twinkle lights and a personalized text template. Rustic Fall Mason Jar Wedding Invitations Suite – features a wooden background with string lights, mason jars and fall leaves. Matching wedding invites, RSVP cards, save the dates, wedding programs, stamps and more are found in this collection. Rustic elegant wedding invitation and stationery collection features a fall theme with autumn foliage and scrolling swirls. Rich autumn color scheme includes shades of orange, copper, brown, red and gold. Rustic country wedding invitations that are just beautiful for your wedding day! Rustic country fall matching invitation suite featuring a wooden barn background, autumn leaves, a candle lit lantern, string twinkle lights and a modern wedding template. Products feature a navy blue barn wood background decorated with watercolor daisies, sunflowers, greenery, baby’s breath, and lily of the valley. Pair these charming Rustic Pumpkins Fall Wedding Stationery Products with the matching invitations to create a coordinated marriage set. Customize these shabby chic postage stamps, envelopes, save the dates and RSVP cards to suit your nuptial needs. These shabby chic custom autumnal wedding paper products feature a quaint floral photograph of little orange pumpkins, yellow red daisy flower blossoms, white bridal veil, vintage lace trimmed linen handkerchief and a natural wood slice with the word LOVE burned on it with a brown barn wood background. Perfect for the bride and groom who are planning a casual yet classy September, October or November fall or autumn wedding theme. Beautiful sunflowers bouquets on barn wood with shimmering twinkle lights or on dark grey / midnight navy blue chalkboard making chic floral rustic country invitations, gifts and party supplies for weddings, bridal showers, baby shower, Thanksgiving or housewarming parties, rehearsal dinners, couple showers or birthday parties. ——– Suitable for summer, autumn fall rustic country themed wedding receptions or parities. Autumn woodland collection featuring a rustic fall tree covered in red, orange and yellow leaves, a carved heart, string twinkle lights and a modern text template. A Rustic Autumn Leaves Mason Jar String Lights Wooden Invitation Suite, with items from invitation to RSVP card, Thank You Card, Stickers, Address Label, Sign Poster, and more. A gorgeous array of rustic country wedding invitations incorporating different aspects of a rustic chic wedding including shades of wood, mason jars, chalkboards, string twinkle lights, lace, ribbon, oak trees, barrels, hearts, chandeliers and flowers. A fall themed wedding and engagement stationery set with a floral and rustic string of lights theme in blush, coral, green, brown, white, yellow and brown hues with a beautiful wood look background reminiscent of a wooden fence and or barrel. An autumnal laurel wreath composed of acorns, berries, sunflowers, tulip rose and white blossoms sit on a leafy branch. The back of some of these matching items can be personalized with the initials of the bride and groom inside a carved tree look heart design. Perfect for an outdoor fall, country, farmhouse, barnyard or rural chic themed wedding. The charming twinkle and fairy lights with a bokeh effect look bright, warm and inviting. Artwork © Chrissy H. Studios, LLC. All rights reserved. A Burgundy Marsala Red Floral Invitation Suite, with items from invitation to RSVP card, Thank You Card, Stickers, Address Label, Sign Poster, and more. A Rustic Gold Orange Floral Autumn Invitation Suite, with items from invitation to RSVP card, Thank You Card, Stickers, Address Label, Party Banner, and more. Rustic old anchor and string lights wedding suite for nautical weddings. 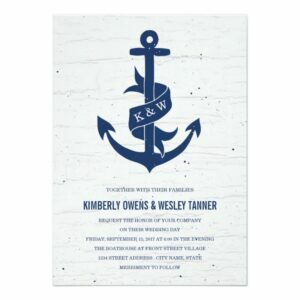 A rustic nautical theme wedding collection featuring the ocean framed by rustic wood, an anchor and a heart shaped tied knot. 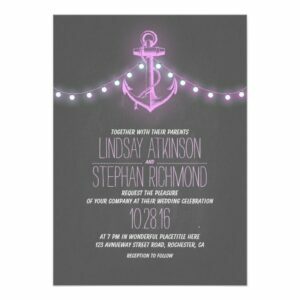 Chic beach starfish and sea shells on glittery string lights + rustic wood grain background designed on custom wedding stationery and matching items! 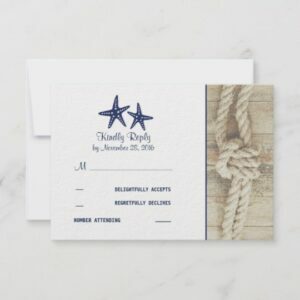 Rustic nautical wedding invitations suite features old rope knot and drift wood, with navy text and nautical elements. Nautical rustic beach themed collection featuring a rustic wood barn background, twinkle string lights, sandy beach with a starfish and seashells. The template wording, font style and color can be easily personalized to suit your requirements.